I am always looking for visual ways to help my kids learn about the world around them. Any time I've had a tough time explaining something to Kaycie, I try to find a way to show her with toys or pictures to make it a bit easier to process. And after a teachable moment successfully comes together, I feel so, so happy that I've been able to pull together a great moment in parenting in that big sea of uncertainty on which I continue to bob along in my little lifeboat (hoping desperately that a compass or map might float up alongside the boat!). I recently stumbled across an article (and judging by the comments section, it was a tad controversial on a small scale) indicating that various studies have shown that because we are living in a society where many children get "shushed" for pointing out someone who looks different and where children are told that everyone is equal, but are not told much more, that we are not doing our children any favours. That by putting our children in diverse environments and assuming that this will - by osmosis - teach them that diversity is natural and good is faulty reasoning. This got me thinking, because in the past few months Kaycie has talked to me often about kids at school, the people she likes, the regular day to day disagreements that her friends get into, the things she hears. It is all very interesting - in fact, hearing her ramblings about her school day is often my favourite part of the day. I have heard her ponder aloud sometimes about the colour of her friends' skin - nothing really inappropriate. I have talked to her about how how the colour of someone's skin does not make them any different from anyone else and that when she makes friends with people that it should be about whether she likes them, and not about how they look - whether that is how they dress, the colour of their skin, the length of their hair, or whatever. The article made me think that maybe I could start looking for opportunities to talk more openly with our kids about diversity and different cultures. I thought I would start small and start visual by using an exercise referenced in the article. 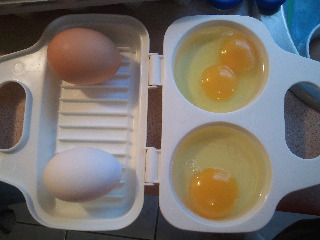 The article suggested that you show your child a brown egg and a white egg and talk about how the colour of their shells are different, but that when you crack open the eggs, they are identical on the inside. Then you can have a discussion about how people are the same on the inside, but are all different on the outside. Well... if you have been reading this blog long enough, you will already be assuming that this exercise didn't go exactly as planned. 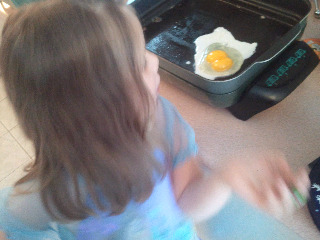 While I was making breakfast this morning, I showed Kaycie a brown egg and a white egg. She was very interested to see that they were the same shape and texture but different in colour. Ta da! 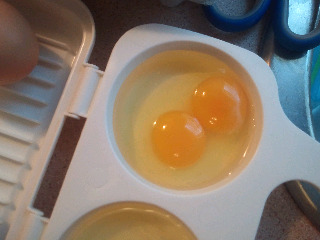 I asked Kaycie what she thought we would see when we opened the brown-shelled egg. She declared quickly that we would see the same thing. I readily agreed with her, and we had a nice little chat about how she might look different than one of her friends, but that they were just the same on the inside and that on top of both of them having muscles and bones and what have you, that they both also probably loved their parents and liked to play outside. 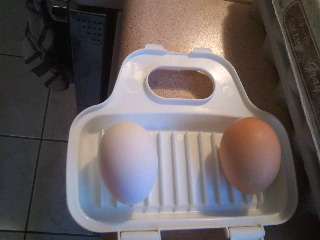 So, we decided it was time to crack open the brown-shelled egg to take a look. As I brandished my egg cracking skills and poured the egg into our dish, I said, "See? They are just the s..."
As we looked at my little visual exercise together, Kaycie looked at me with a bit of a bewildered face. Oh yes... we were learning. I had better think fast on this one! I said, "Well aren't we lucky!!! Those eggs were SUPPOSED to look the same on the inside, but eggs are a funny thing and very, very, very rarely an egg has TWO yolks inside! It hardly ever, ever, ever happens... can you believe that this happened to us when we were trying to see that people are the same on the inside? I can't believe it, can you Kaycie?" She was grinning from ear to ear and agreed that she couldn't believe our luck either. 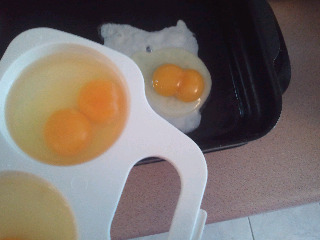 Slowly I cracked a third brown egg - subtly checking the carton to see if it was labelled "FRAGILE: extremely rare double-yolked eggs" - and held my breath as we all looked to see what came tumbling out of the shell. 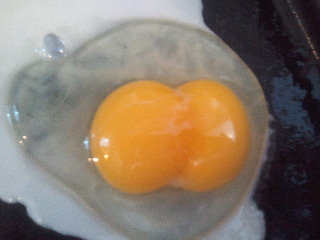 A single yolk! 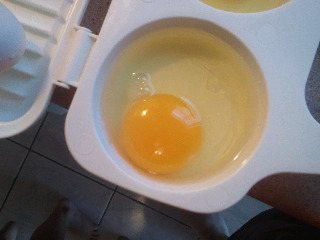 And I proudly showed off my single yolk egg, holding Kaycie's angelic little face in my hands and saying, "See?!? We really ARE all the same inside!" It was then that I realized that I actually had a way BETTER lesson sitting right in front of me. Our bizarre egg cracking expo allowed Kaycie and I to sit down and talk about how all eggs might be different colours, but inside they all have yolks and egg white - sometimes there might be a different number of yolks, but that's just like people. People are all basically the same inside - we all have a heart, a brain, blood, etc, but our insides can be slightly different because we all have different personalities too. Some of us like to ride bikes, and some of us like to play guitar, and some of us like to colour, and so on. Luckily Kaycie did not wonder aloud if Knolan might have 2 brains or anything like that. But she did say, "Yeah! Like the way I like princesses and Knolan likes to break things with his hockey stick! Right, Mom?!" All I could say was, "Right, Cutie." Labels: diversity, failed visual aides, Get Crackin', learning is fun, rare double yolks, teaching is hard. HAAAA!!!! Too funny! But what a great save. An excellent lesson for young and old alike.